T‑Mobile MONEY is the bank account that puts you and your money first. Everyone earns 1.00% Annual Percentage Yield (APY) on all balances and T‑Mobile wireless customers with qualifying service who deposit at least $200 a month can earn an industry-leading 4.00% APY* on checking account balances up to $3,000. No account fees, no maintenance fees, and no minimum balances. Plus, access over 55,000 fee-free ATMs worldwide with the Allpoint® ATM Network – that’s more than Bank of America, Chase or Wells Fargo! T‑Mobile MONEY accounts are held at BankMobile, a division of Customers Bank. All Rights Reserved. Member FDIC. 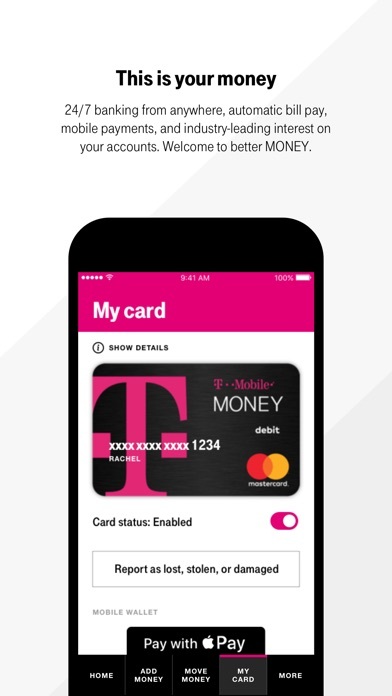 PAY THE WAY YOU WANT Your T‑Mobile MONEY account includes a debit card with EMV chip, plus it works with Apple Pay. HASSLE-FREE MOBILE BANKING Easily transfer money to and from your external accounts for free. 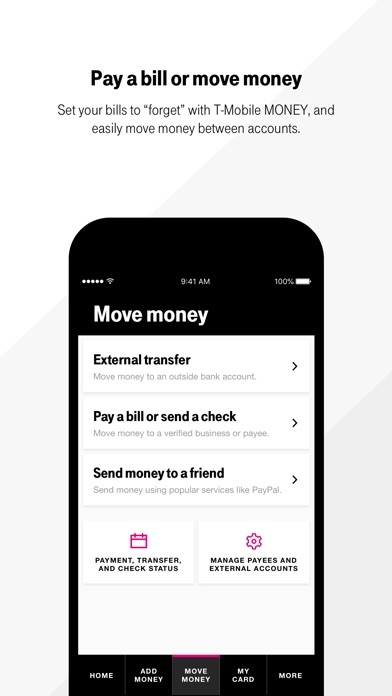 Send a check, pay bills, or direct deposit a portion or all of your paycheck to your account – all with just a few taps in your T‑Mobile MONEY app. STAY CONNECTED TO YOUR MONEY Access your money anytime with the app and enjoy 24/7 customer support. SAFE & SECURE Prevent unauthorized account access with multi-factor authentication. Log in with Touch ID and Face ID. Enable or disable your debit card remotely if it’s lost or stolen. Accounts are FDIC-insured up to $250,000. Plus, with Zero Liability Protection from Mastercard® you’re protected when fraud occurs. ------------------------------------ *How APY works and what it means for you: As a T‑Mobile MONEY customer you earn 4.00% annual percentage yield (APY) on balances up to and including $3,000 in your Checking account each calendar month when: 1) you are enrolled in a qualifying T‑Mobile wireless plan; 2) you have registered for perks with your T‑Mobile ID; and 3) you have deposited at least $200 in qualifying deposits to your Checking account within the current calendar month. Promotional deposits are not eligible toward the $200 in deposits. If you meet this deposit requirement in a given month we will pay you this benefit in the subsequent month as an added value provided all other requirements are met. This added value is subject to change. Balances above $3,000 in the Checking account earn 1.00% APY. The APY for this tier will range from 4.00% to 2.79% depending on the balance in the account (calculation based on a $5,000 average daily balance). Customers who do not qualify for the 4.00% APY will earn 1.00% APY on all Checking account balances for any month(s) in which they do not meet the requirements listed above. APYs are accurate as of 11/1/18, but may change at any time at our discretion. Fees may reduce earnings. For more information, see Account Disclosures / Terms and Conditions or go to our FAQs. As I got to profile info step two the app froze and did not accept input. Had to restart several times. Then figured out single click is two step touch once to select button for example. Touch again to click or depress said button. After all the entry stuff inside the actual app barely worked and hung froze not of the time. This is not even beta code this is alpha at best. I sure hope the actual services are better than this initial release. Time will tell. I know it’s the first day and all that. My question is why you would release it with this many bugs and app issues. I mean once it’s up and running a few months from now after the bugs get worked out I’m sure it will be great. I expected better quality from day 1 with you guys, this just seems rushed and not planned well. The guy who created this bank seems to be the guy who created BET but if you go to their site you get from LinkedIn, you get a landing page for IIS 7. Seriously. The program seems glitch but if you're having an issue with it remembering your account, after you log in and set that up, enable biometrics and log out. Now it remembers your login and works fine. It's not a major bank but as long as it is FDIC insured, I guess it is OK. It supports Samsung Pay, so it can't be all bad. I do like the overdraft fee waving if you don't go over $50 overdrawn and pay it back in 30 days I'm trying it out for a month and will see how it goes. This app does not work. Continually crashing on me when trying to use and setup an account. Not sure I can trust a Money / Banking app that continually says “Opps! Something went wrong!” That’s not ok. I was trying to setup an account - 3+ times and cannot. App used to work but now just stuck in a “processing” loop after attempting sign in. Would be 4 stars but not able to access the account anymore on iOS is pretty inconvenient. I can access on PC, Android, etc., but is broken on my iPhone X 12.1.2 iOS. Uninstalls, reinstalls, powercycling won’t fix the issue. Emptied bank account and closing soon. If I can’t access my bank account easily, you don’t get to hold my money. 4% isn’t worth the frustration. I opened my account at the end of March. 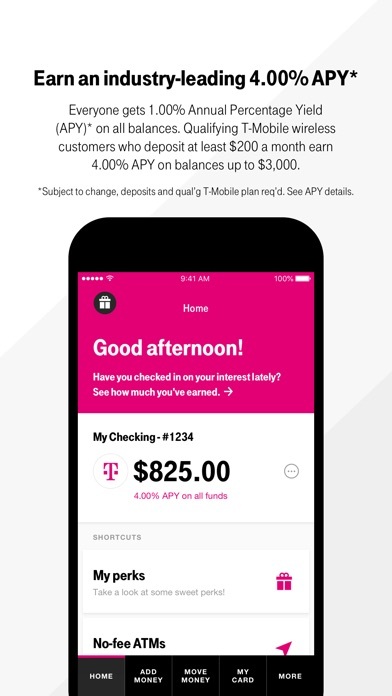 The bank pulls the information from T-Mobile. I verified my information was correct with T-Mobile. T-Mobile Money pulled a previous address from 7 years ago and their system does not allow an address change within the first 30 days of opening your account. Again I verified my account information is correct with T-Mobile. They mailed my debit card to the wrong address. The sales representative asked me if I wanted to activate my card, that was mailed to the wrong address. The way the system is set up, it is not possible to update your address even during the application process. T-Mobile decides where they will send the card and where they will ship your account information. Then they make you wait 30 days. Save yourself a lot of hassle and open an account elsewhere. App literally never works for me. Tried logging on these past few day either get an error message or stays loading. Few times I have been able to log in my balance shows incorrectly & even after I call it still reads me back the incorrect amount. Seems like I can’t ever use this app without requiring another update. So annoying. I love the idea of my money accruing interest, but this app is far less sophisticated than the banking platform. I can’t see my balance consistently, and the app keeps asking me to “activate” my card. 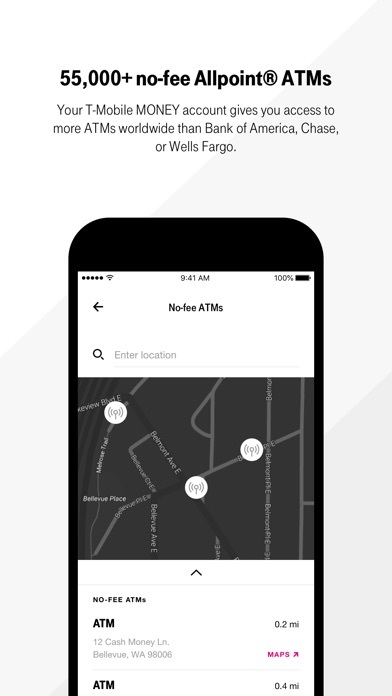 There are supposedly “Free ATMs”, but when I search, literally nothing comes up. I’m forced to take it on faith that my money is there and available to me, somehow. I’m feeling naive for taking a chance on another Tmobile financial investment, & hope it doesn’t take 10 years to get access to my financial information via this app. Every time opening the app, there’s no balance display and app crashes whenever I try to click on statements. Will close account soon! The ios version of the app crashes and freezes all the time. I had to grab my android to be able to activate my card via de app and I cannot even perform a transfer without the app freezing on ios. After the most recent update I can no longer see my account balance or transaction history. Wish I didn't update my app. Can't see my money and transactions....what's the point of having an app without that. Please fix ASAP. Have loved this app for the last four months, but there are huge problems with version 1.1 released yesterday. The app no longer displays an account balance, and the app “unexpectedly quits” whenever I try to initiate a transfer or really do anything within the app. Now I can’t access my money. Please fix this! Better than a regular bank. Snap deposits and free atm. I can’t see my funds!!! App constantly crashes and does not show my funds at all!!! T-Mobile money launched during a time where I was struggling with money and was getting hit left and right with overdraft fees from Wells Fargo. This bank has no such thing. The 4% interest is great, especially since I use this as my primary bank account so I always have over $200 in it. 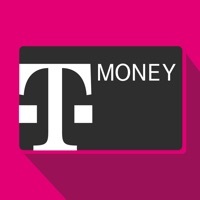 The only down side to T-Mobile money is that account transfers can take a good amount of time to go through. Very frustrating not being able to manage my account through the app. Havent been able to access for two weeks with not fix in sight. I’m enjoying the 4% and like the fact that it works with Apple Pay and Google pay. I like the look and navigation of the app when it lets me log in. They need to do a better job of quickly updating the app for small issues that may prevent people from accessing their account. Once they do that I’ll give them a 5 star rating. Awesome 4% APY but please raise the maximum amount higher than $3,000. New customer last week, added and confirmed external transfer. Made initial deposit transaction on 2/15/18. Told funds willl be available Wednesday. Here we are Tuesday, when funds were debited from my primary account to tmoney, my account access is now restricted for “unusual activity”. Now I have $800 sitting in an account that is basically useless and unpaid bills. Pretty much my phone will be suspended now due to this issue. Thanks for nothing. Here is why. I like many people thought this was a cool thing. Well not quite. Their app does not work at all. And their customer service is just as bad. Here is my experience. As a long time tmobile customer, I decide to sign up. Then the part that would make even the most patient monk scream in frustration. I link an external bank. And then try to transfer the $200 for the month that is required for you to get the 4%. It stops me and gives me a generic message. I call customer service. Have been calling them for 4 weeks. No one on that end has an answer as to why it can’t transfer. I keep on asking for supervisors and for someone to call me back. No one does.Hmmm. Ok, so let me try depositing a check instead thru their app. They app declines that check the 3 times I have tried it because no Matter how I take picture the app cuts out routing and account numbers. So can’t even deposit that way. Finally I call again regarding the external transfer and they finally tell me that the problem is my bank. I just finished setting up another bank before writing this review and can you guess what happened?! Yup that one is also not going thru, with only a general message to call customer service. A maddening customer service hell I am trapped in. This is a text book example of how NOT to roll out a product. Tmobile money will probably respond to this review with a generic, sorry you had this problem, please reach out to our customer service staff. So tired of having to call in just to check my available balance since the app doesn’t work !!!! They need to roll out an update so people can use the app again it’s very frustrating . There’s checks I need to cash and transfers I need to do. Also representatives keep creating tickets for me but I’m not hearing back about the issue . All of them say something completely different I’m convinced there not even real bankers !!!! Their just as clueless as the person asking the question and it’s frustrating. Step it up Tmobile or your losing another customer!!!!!!!! They only give accounts to the rich if you’re poor you cannot get a count. The app starts to refuse log ins a few days after the install. Regardless of enabling biometrics or not. It’s not yet ready for use. Haven’t been able to check my balance through the app since last week. Don’t know what the problem is. The log in on this app for iPhone just flat out dose not work at least half the time for me which is crazy because this is a banking app. It doesn’t give a error or anything you type in the pass and a white box pops up that says ok, you click it and nothing happens... On a more positive note it work fine on the website and I’m impressed that a company like t-Mobile is stepping into banking with such an awesome high interest rate checking account, but the app definitely need work. The app is completely usable but login can be buggy and glitchy, and does not qualify for FaceID. If I had to pick one priority, it would be to fix FaceID so that it works well. In 2018/2019, all iOS applications should be able to use Face ID. Otherwise, it works, although some functions are not intuitive. If you want to set up billpay, my advice is to use your Mac to do that. I also think that four days is too long to verify an incoming transfer of funds. My brick and mortar bank accomplishes it in one day’s system refresh. It will never take four days and only *looks* like three days when you do something Friday evening that won’t be approved until Monday midday. This needs some improving, but it is not the fault of the application developer. 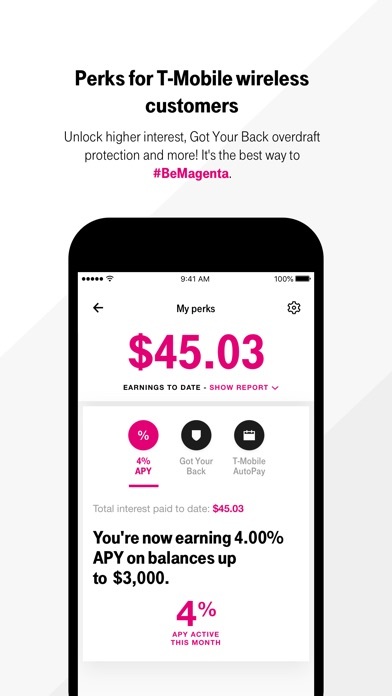 I like the idea of T-Mobile Money, but this first attempt at an app needs a little fine tuning. :-) Update: Mobile check deposits don’t show up in the account even as pending funds, so you don’t know if the deposit worked. I entered all correct info and it says i cant make an account at this time why !???!??? Great cellular and data service. Great bank account! I could actually use the app. I just got my card in the mail today and was trying to go through the process of setting it up. I can’t get passed the security questions without being greeted with an error message. I guess I’m screwed?! This app has potential to be a great banking alternative. I like the look of the app. There is one fault though. Please make the login pop up appear automatically when you open the app much like apps like Bank of America or other banking apps. Absolutely annoying to have to search for my password to my T-Mobile account. Please make it where all I have to do is scan my face or my fingerprint to login. The only way to add cash into your account is via direct deposit, transferring money in from your REAL bank account or getting a money order and depositing it using the app. Biggest waste of time. No one cares about the 4% APY, we all have T-Mobile, we’re poor and won’t make anything off of it. I miss the old T-Mobile Money card. Notice how it doesn’t mention a maximum daily withdrawal. Make it incredibly card to add money or use it.